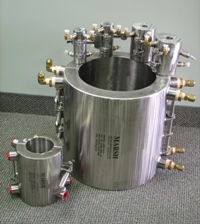 It was recognized that current pipe freeze technologies, widely used in commercial applications, utilized a single wall device which although somewhat effective, produced a number of side effects which were not considered acceptable for nuclear and other high end applications with respect to human engineering and safety parameters. Double controlled venting minimizes the amount of freeze catalyst required to maintain the freeze. Lightweight construction for easy installation / removal in congested areas. Marsh "Ice Plug Freeze Jacket" are designed to meet all applications in the Nuclear, Food and Petrochemical industries. Taking into account shortfalls in pipe freeze technologies, Marsh has developed and produced an innovative ”Ice Plug Freeze Jacket” system.